Artprize 2013 shot of the Grand River from downtown Grand Rapids – if you look close you can see the monkey sculptures hanging on the blue bridge. This one is not multiple shots, though I adjusted the tone curves enough that it is probably considered HDR. Picture taken with Canon 60D, EF-S 17-85mm lens @ 21mm, f/9, 1/130 second shutter, ISO 100. 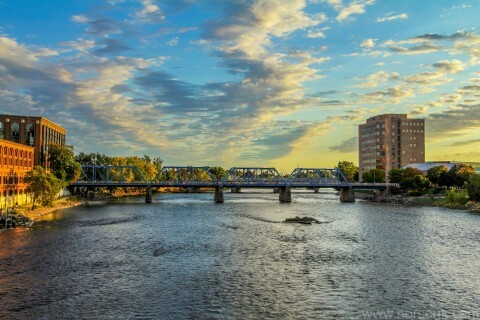 Tagged canon 60d, daily photo, grand rapids, photo editing, photoblog, photography, pictures. Bookmark the permalink.